Fairwell to an historic building! 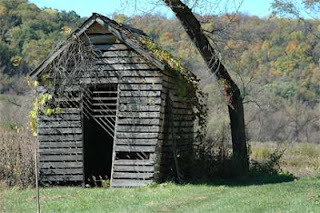 Those who hiked near the wetland should remember the old corn crib that sat right between the Barn and Crane Prairies. This little building dated back to the original Lockwood farm and at one period housed a privy. In recent years it was just a nuisance, especially when we were burning the two nearby prairies. 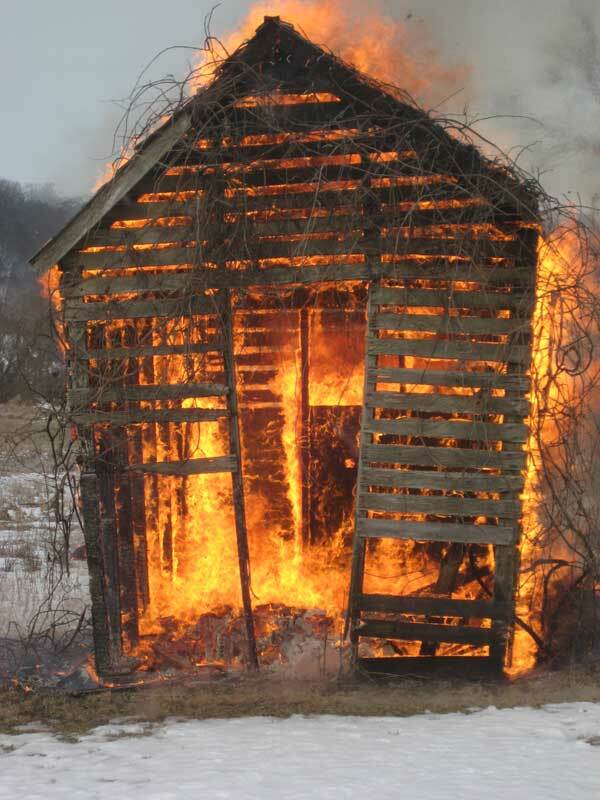 Twice in the past few years its roof caught fire and we had to stop the prairie burn until it was put out. Since it only had sentimental value, we decided it had to go, and with good snow on the ground now was the time. Yesterday Amanda and Chris touched it off and as might be expected with such an old, dry building, it burned to the ground in no time, as Amanda's photos show. The Crane Prairie is just behind the embers in the photo below, with the wetland behind. Now that it is gone, we can expand the prairie into that area. Perhaps we can even connect the Crane and Barn Prairies together? 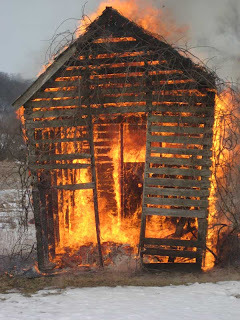 Those of us who have been working at Pleasant Valley Conservancy over the past 16 years are a little sad to see the corn crib go, but time marches on. A 2006 autumn view of the former corn crib. On the map here only trees >= 12 inches are shown. Also shown (in small yellow dots) is shagbark hickory, since that is a common associate with oaks in our area. There are a number of other tree species (hackberry, cherry, basswood, birch, etc.) but these are not shown in this map. For maps showing locations of individual species of oak, go to this link. 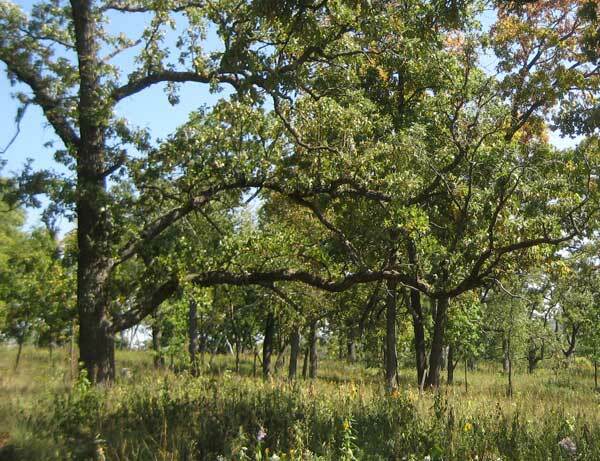 In the 1990s there was a flurry of interest in oak savanna restoration. In 1993 the Environmental Protection Agency funded a symposium/workshop on oak savannas. The next year there was a symposium on Barrens and Savannas at Illinois State University (Normal, Ill.), also partly funded by the EPA. Then in 1995 EPA funded a meeting in Springfield, Missouri which led to a publication called the Midwest Oak Ecosystems Recovery Plan: A Call to Action. Finally, in 1997 another Midwest Oak Savanna and Woodlands symposium was held at the UW-Madison Memorial Union. Looking back at the 1995 Recovery Plan, I see that we had lucked out. We had a classic Northern Bur Oak Opening: "Quercus macrocarpa-Quercus alba-Quercus velutina/Andropogon gerardii Sparse Woodland, more often referred to as Oak Opening, is a dry-mesic to mesic community that commonly occurs on level to moderately steep, fire-prone landscapes in...southern and western Wisconsin.... Canopy cover ranges from 10-30%. The groundlayer is dominated by graminoids, especially Andropogon gerardii and Schizachyrium scoparium, accompanied by a large diversity of forbs.... Understory species typical of oak openings require some direct sunlight throughout the growing season and are quickly reduced when heavily shaded by either tree or shrub canopy. Common shrubs in this community are adapted to the moderate fire frequencies found in oak openings, and resprout vigorously after burning." Other groundlayer species that the Recovery Plan said might come back after restoration were: " Upland Boneset (Eupatorium sessilifolium), Purple Milkweed (Asclepias purpurascens) ... Cream Gentian (Gentiana alba), Yellow Pimpernel (Taenidia integrima)," all of which are now flourishing at Pleasant Valley. The Recovery Plan was also optimistic that Wisconsin might have a lot of restorable bur oak savannas: "[In Wisconsin] it is anticipated that...Oak Openings might still be found in the 'Driftless Area' of southwestern Wisconsin. This region has many narrow, untillable ridges, steep topography and a pre-WWII history of fire use by landowners that may have enabled the persistence of small, recoverable, moderate quality Oak Openings." 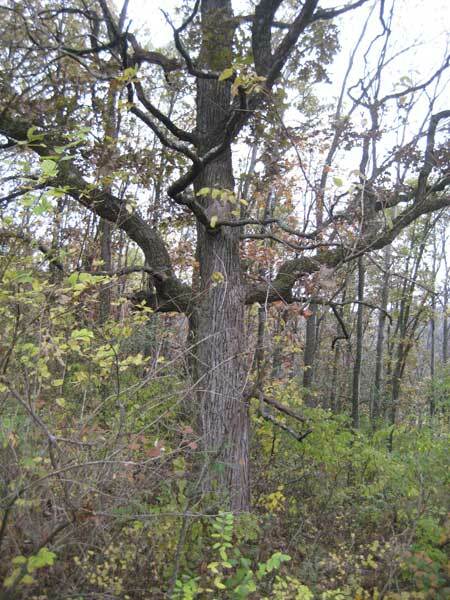 In southwestern Wisconsin I have seen quite a few sites where large open-grown bur oaks are present. The photo below is an example, showing what foresters call a "wolf tree". 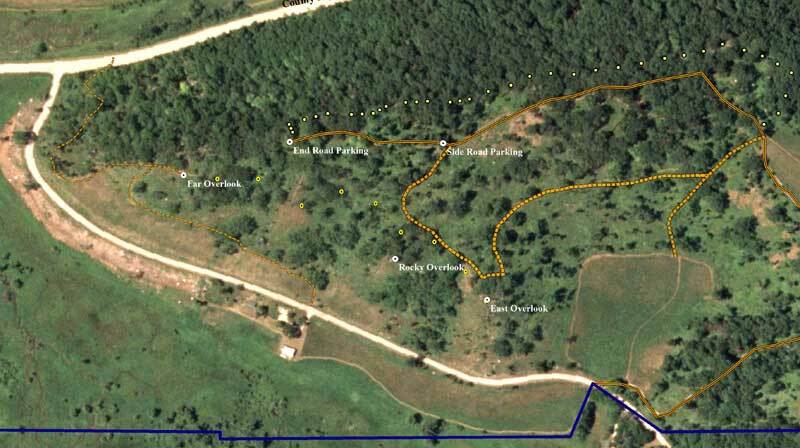 The point of this post is to encourage landowners who think they might have promising properties to contact the Blue Mounds Area Project and request a survey by the resident Ecologist. For further information, check the BMAP web site. Wolf tree in a southwestern Wisconsin woodlot, an indicator of a potentially restorable savanna. 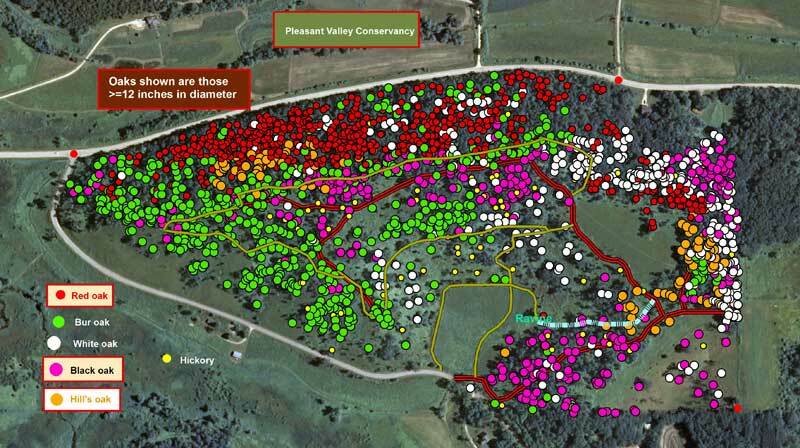 I have been using GIS to keep track of the restoration work at Pleasant Valley Conservancy. The first air photo below is from 2005, just after we had completed our major work of clearing. Note how raw the land looked, with numerous bare areas. The Crane Prairie (the long, narrow, sandy area below Pleasant Valley Road, had just been cleared in January/February and the small white dots were where brush piles had been burned. 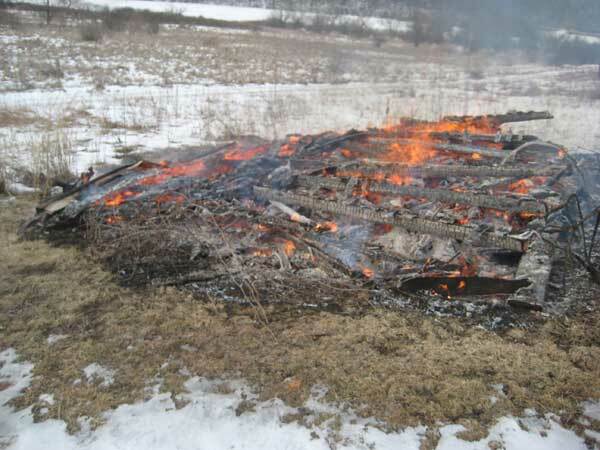 I counted over 70 piles that we had burned in late winter. The second air photo is from 2010, after the land had a chance to revegetate. The bare areas are gone and everything looks healthy. I was surprised at how open and raw some of the cleared areas looked in the 2005 photo. This emphasizes the importance of seeding (or interseeding) after clearing. We have always done this, and I'm sure it makes a big difference in the results. The other consequence of seeding is that it helps provide for burns. All of the areas on these photos have been burned every year since clearing, and it makes a huge difference. The Crane Prairie was planted in December 2005. In its fifth growing season in 2010 there were 87 species. Take a look at the Crane Prairie page on our web site. In my last post I discussed the value in a restoration project of doing Photo Points. After a few years it is hard to remember what a particular site or management unit looked like before it was worked on. 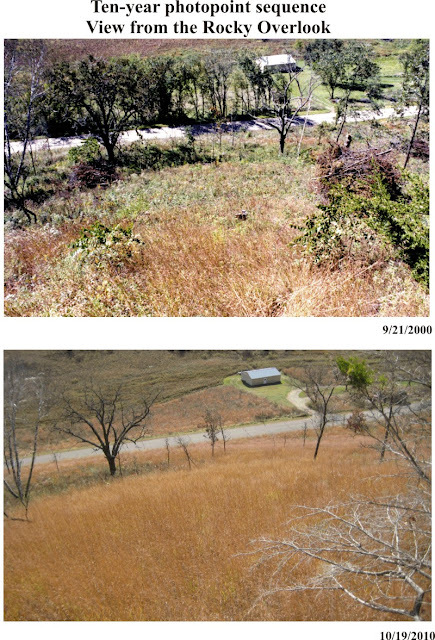 The two photos in this post from Unit 6 were taken from the Rocky Overlook about 10 years apart. This viewpoint is a favorite spot and there is a Leopold Bench there now. 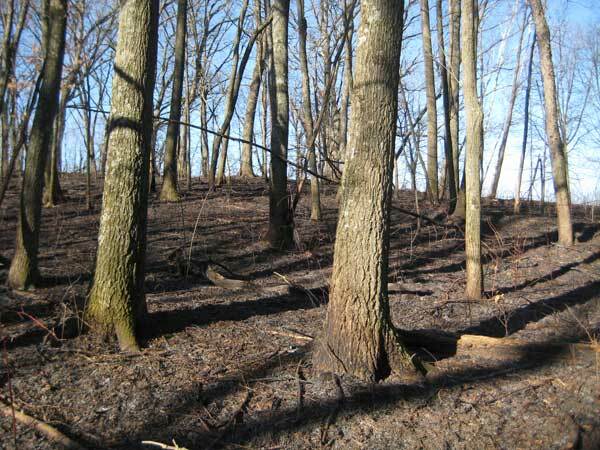 The photo from 2000 was taken just after the major clearing on the south slope was done, but before any burning. The two photos show some interesting differences. In the 2000 photo the small stand of big bluestem just below the rocks is visible, but there are only scattered prairie grasses below. By 2010, after 10 years of annual burns, the whole hillside is tallgrass prairie. Some other changes can be seen farther down. Along the south side of Pleasant Valley Road in 2000 there was a large number of substantial trees. These were primarily slippery elm and were removed in 2001 just before we started work on the Valley Prairie. A small amount of the well established smooth brome stand in the Valley Prairie is visible below the trees. What is now the Valley Prairie was herbicided in 2002 during the summer before the November planting. The Valley Prairie itself is now well established and easily visible in the 2010 photo. I spent some time today looking at really old photos from Pleasant Valley that were taken in 1981 and 1982. (We bought the first part of the property in 1980.) In those days I took mostly Kodochrome slides so I had to use magnification to view them.At that time the south-facing slope was fairly open even without brush cutting. I hope to scan a few of these for a later post. When I first started doing photo points, I tried to mark the sites, but as the years went by I simplified the system. Now I use sites that are well recognizable, with a characteristic hill, tree, or other structure. 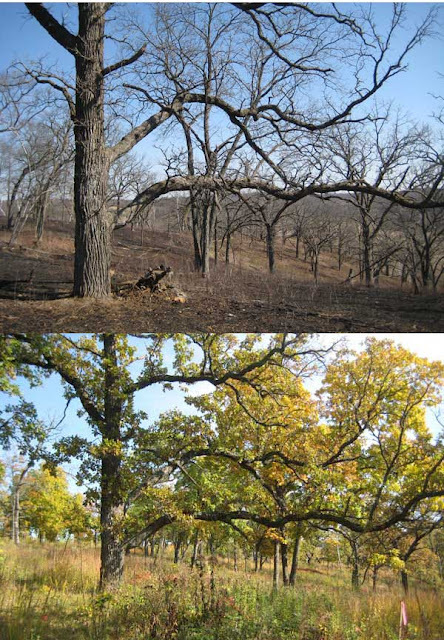 The bur oak in the photos here (from the Unit 10 savanna) is easy to spot. The top two photos are from 2009 and the bottom one from 2012. Unfortunately, I never got any photos of this site when it was full of buckthorn, although I remember it well. In the photo with the fall view the ground would have been choked with buckthorn plants, which would be easy to see because their leaves would still be green. This photo was taken 9 years after this savanna was cleared. Also, every year we control seedlings and root sprouts. As you might expect, it is difficult to get exactly the same image every time. The reason these three are close is because they were cropped. 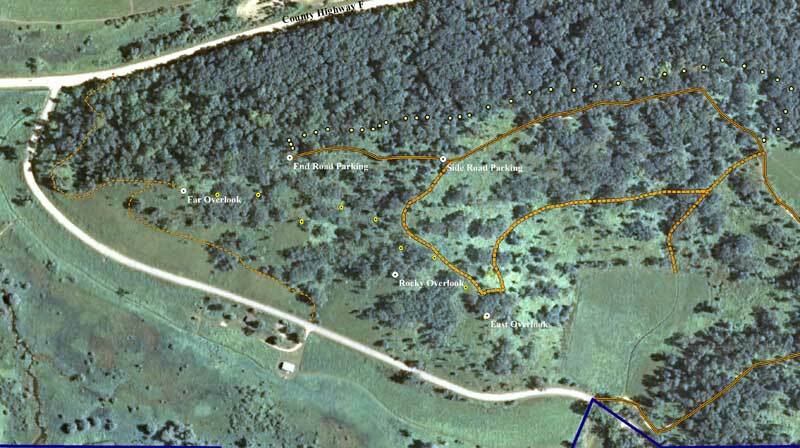 Is prescribed fire in oak woods a disturbance? I've been spending a lot of time reading the literature on the role/use of prescribed fire in oak savannas and woodlands. The consensus among forest ecologists seems to be that fire is essential if oak forests are going to have any long-term future. This idea seems to be widely accepted. It is based to some extent on research studies and to a great extent on numerous observations by foresters and plant ecologists. The point of this post is that many people who write about this topic call prescribed fire a "disturbance." Here is a sentence one often sees: Oak forests require periodic fire disturbances if they are to regenerate and be conserved. The word "disturbance" in this context is pejorative, implying something bad. I am concerned about using it because it may be misinterpreted by the general public. Those of us involved in prescribed burns know that a large number of people think burns are harmful. Suggesting that fire in a forest is a disturbance suggests some sort of harm. Not so. Oaks evolved in a fire-prone environment and without fire might not survive as a species. Fire is not a disturbance to oaks but is in fact a beneficial (healing) force. This is especially true for fire in the dormant season. Instead of "disturbance" I suggest the word "renewal" be used. Thus, "oak forests require fire as a periodic renewal agent to regenerate and be conserved." Maybe this is a minor issue, but prescribed burners need to convince the general public that what they are doing is important, perhaps even essential, if such an important species as oak is to survive. Oak woodland after being "renewed" by a prescribed burn. Kathie and I spent the past three days in Dubuque, Iowa at a big fire conference organized by the Tallgrass Prairie and Oak Savanna (TPOS) Fire Science Consortium (see map and logo below). This organization is one of 14 regional consortia that consist of local experts that help burners get connected with managers, practitioners, and scientists working in their area. They not only provide the best fire information for each area, but they demonstrate new knowledge in the field. Although I am never sure about the various branches of the Federal government, I think these fire science consortia are funded out of the Department of Interior, mainly F & WS and BLM. How this relates to fire science in the US Forest Service (which is in the Department of Agriculture) is beyond me..
Because of the way the fire science consortia have been set up, we have two that involve the Madison area, TPOS and the Lake States Fire Science (LSFS) Consortium. LSFS, based at Ohio State University, has been in existence for a few years and offers very good Webinars at monthly intervals. TPOS, based out of the Nelson Institute at UW-Madison, is still in its first year but with the Dubuque meeting over it is clearly off and running. Attendance at the meeting was about 350, with attendees coming primarily from Illinois, Iowa, Minnesota, and Wisconsin. There were also people from Michigan, Ohio, Indiana, Missouri, North Dakota, Colorado, Oklahoma, North Carolina, and Kansas. The program was diverse but focused on practical matters related to prescribed burns. It was a real "nuts and bolts" meeting, which was just perfect for us. I won't go through the highlights, because all the talks were good, and the program and abstracts are available on-line. Eventually, all the Power Point slides will be on the TPOS web site. Also, many of the talks were recorded, and the recordings will be used along with the slides. Now that we are in February, it is time to get serious about burn plans. I have ours all finished and will be sending it off to the DNR sometime next week. With all the snow on the ground, it's hard to believe we will be burning soon. However, last year we did our first big burn on March 13!